This is the kind of book that I love. The Creation of Anne Boleyn is not so much a biography of one of England's most famous women as a cultural history of her legend & the way she has been portrayed in literature & history. Bordo goes back to the original documents & looks at what can be known as opposed to what can be imagined by the fertile brains of biographers, historians, novelists & movie makers in the almost 500 years since Anne's execution. The "creation" of Anne Boleyn began even before her death. From the moment when it became apparent that Henry VIII was interested in Anne, her supporters & detractors lined up to try to control her image. There is very little evidence of what Anne herself said or thought. There are few letters although much has been made of the letters Henry wrote to her during their relationship. Much has been inferred of her thoughts & feelings from the replies that historians & novelists have imagined Anne to have written. There was much gossip about her relationship with Henry & her relationships with the other members of her Court. Most of what we know of her actual words comes from her trial & the period she spent imprisoned in the Tower when her every word was recorded by her jailer, Sir William Kingston & the ladies who waited on her. There's also a fascinating letter which was found among the belongings of Thomas Cromwell, the King's chief minister, whose authenticity has been disputed by historians. Bordo believes it's genuine & it shows Anne as a spirited woman desperate to convince Henry of her innocence. Try me, good king, but let me have a lawful trial, and let not my sworn enemies sit as my accusers and as my judges; yea, let me receive an open trial, for my truth shall fear no open shame, then shall you see either mine innocency cleared, your suspicions and conscience satisfied, the ignominy and slander of the world stopped, or my guilt openly declared. Anne's reputation has suffered because, after her death, Henry was determined to erase all trace of her from his life. Her badges & symbols were removed from the palaces where she lived with Henry; her portraits were destroyed. The famous portrait in the National Portrait Gallery of Anne wearing the pearl necklace with the B pendant is a later copy of what may have been an original portrait. Even Anne's appearance has been disputed. Was she dark, sallow & sharp-featured with an extra finger & a third breast? Was she a blond beauty whose sense of style & wit that she had cultivated at the French Court captivated the King? Mostly it depends who you're reading & what the standard of beauty was at the period that the book was written. Anne's image has been influenced by the fact that the most extensive information about her that has survived from her lifetime was written by one of her bitterest enemies. Eustace Chapuys was the ambassador of Emperor Charles V at Henry's Court. Charles was the nephew of Catherine of Aragon, Henry's first wife, the woman he wanted to divorce so that he could marry Anne. Chapuys' reports to Charles are full of venom. Anne was a temptress &, even worse, a Protestant temptress, luring the King away from the true religion & leading him to the break with Rome that became the Reformation. She was said to have plotted the murders of Catherine of Aragon & Princess Mary in her quest for the crown. Chapuys' reports have formed the basis for most of the hostile reporting about Anne ever since even though he was biased & the gossip he heard & reported to his master wasn't always accurate & can be proved so from other sources. Anne's supporters, led by George Wyatt, author of a biography of Anne in her daughter, Elizabeth's reign, portray her as a Protestant martyr. She is said to have encouraged Henry along the road to reformed religion & been betrayed by Catholic plotters. Wyatt was the grandson of Sir Thomas Wyatt, the poet who had known Anne & been sent to prison at the time of her downfall on suspicion of being one of her lovers. In George Wyatt's biography, Anne was intelligent, witty, beautiful & committed to religious reform. The most fascinating section of the book deals with the many depictions of Anne in popular culture, especially in the 20th & 21st centuries. From Merle Oberon in The Private Life of Henry VIII (1933) to Genevieve Bujold in Anne of the Thousand Days (1969) & Natalie Dormer in the television series The Tudors (2008), Anne has epitomised the style of beauty current at the time. Howard Brenton's recent play, Anne Boleyn, even starred a blonde Anne, played by Miranda Raison. Bordo has interviewed Dormer, Bujold, Brenton & Michael Hirst, the scriptwriter of The Tudors. They all have interesting insights on the way Anne has been portrayed & the ways that they tried to depict her. Most interestingly, Howard Brenton's Anne is primarily a religious reformer rather than either ambitious would-be queen or vampish temptress. Bordo also takes a look at historical fiction from Jean Plaidy's The Lady in the Tower to Margaret Campbell Barnes's Brief Gaudy Hour (both of which I remember fondly from my teenage years along with many other novels about Henry & his wives). Bordo is not afraid to voice her strong opinions. She's scathing about biographers & historians like David Starkey, Alison Weir & G W Bernard & her chapter about Philippa Gregory's The Other Boleyn Girl is titled Chapuys' Revenge! She also surveys the many internet sites & blogs dedicated to Anne. Interestingly, Anne has become a role model for young women today, a fact brought out as a result of surveys conducted by the author through some of these websites. I find this identification with a historical figure quite disturbing. Through modern depictions of her, especially in The Tudors & The Other Boleyn Girl, Anne has been appropriated as a modern woman with modern aspirations & feelings. I just don't think this is helpful when looking at her as a figure in her own times. If I have a reservation about the book it's that Bordo is almost too absorbed in her subject. She seems to have lived & breathed Anne & I think her objectivity has suffered as a result. Nevertheless, this is a fascinating look at the cultural history & afterlife of a woman whose life & times has fascinated me for many years. 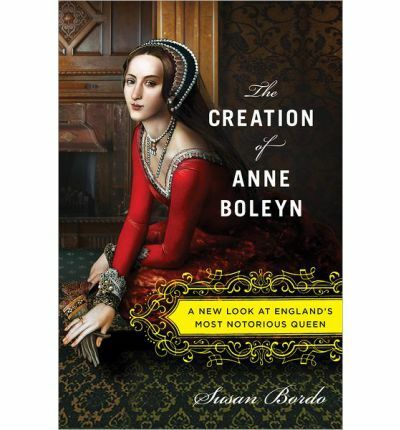 I read The Creation of Anne Boleyn courtesy of NetGalley. This sounds fascinating! This cultural/historical approach seems to be used in some of the most fascinating writings on my favorite poet, Sylvia Plath. It is interesting -- and in a way horrifying -- how famous women are written about / interpreted based on stereotypes and gossip of the past. I've always been fascinated by Anne Boleyn & I love reading about the different interpretations of her life. Richard III is another favourite subject & his reputation has suffered just as much as Anne's over the centuries.